Kay Cude is a Christian poet who uses photos or illustrations as a backdrop to her poetry on major Christian themes. The following is used with permission. Click to enlarge. Here is the Artist’s Statement. We are so very enthralled by the beauty of this earth. Its splendor loudly declares it to be the handiwork of GOD THE I AM. How profound is His grace to share the wonders and workings of His creation with all mankind, the righteous and the unrighteous (Matthew 5:44-45). But as His redeemed Bride of Christ, we know this earthly realm is not our “home;” its final stages are playing out vividly before our eyes. We therefore live expectantly awaiting “eagerly our adoption as sons, the redemption of our bodies” (Romans 8:18-25; 1 Thessalonians 4:13-18) while this present earth and sin continue their measured steps into a final death throe. We, the Bride of Christ, yearn for the many who do not know Christ to listen to our pleas for their salvation. 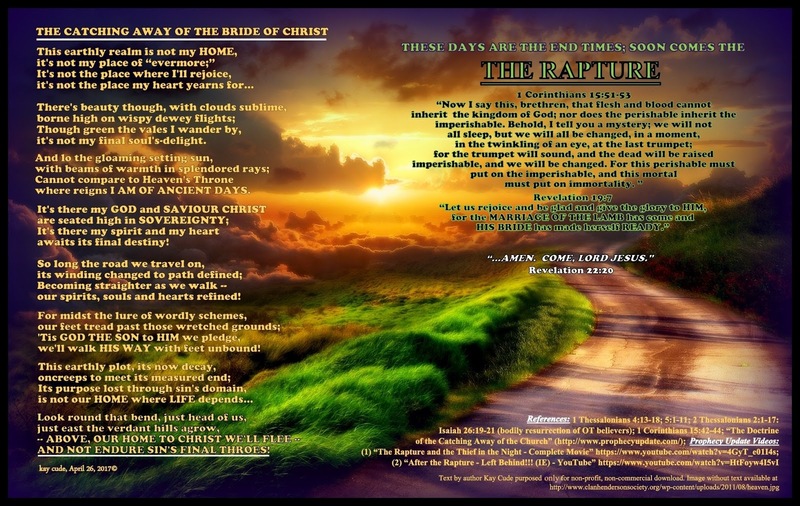 These end times are a herald for false teachers and “religions” to present counterfeit and deceptive narratives of another Gospel (Mathew 24:24; Mark 13:22; Galatians 1:3-10; 2 Timothy 2:13; 2 Peter 2:1-3; Revelation 13:13-14), the Rapture (Harpazo, Strong’s G726 – harpazo; 1 Thessalonians 4:15-18) and the Day of the Lord (Isaiah 13:6-13; 1 Thessalonians 5:1-11; 2 Peter 3:1-10). Too easily “natural” man succumbs to error ignorantly, willingly or because satisfying the “flesh” is the only thing one knows and it is preferable and seems, sounds or feels “right.” Perhaps one has never heard the TRUTH that GOD or that He as Creator is Sovereign over all things, and is patient and loving and ready to forgive and reconcile man to Him through Christ. Or perhaps they don’t understand that man’s life was never meant to be separate from GOD and that their sin and futility initiated through Satan, the deceiver (Matthew 13:19; John 8:44; 2 Corinthians 11:3, 14; Daniel 8:25) can be voided through receiving Christ as Saviour (What Does it Mean to be Saved?” Ephesians 2:8-10″ https://bible.org/seriespage/lesson-2-what-does-it-mean-be-saved-ephesians-28-10). So while we speak of our catching away, we also speak warnings of the coming Tribulation.